The delicate aroma of tea dances on the hill-top breeze as tea plantations compete for space among the thick forests of exotic spices around Munnar. Here, the highest peak south of the Himalayas towers over a stunning National Park sanctuary that reveals the unexpected natural beauty of southern India. This was an important historic post on the spice route and the heady aroma of spice farms in Kerala make for a fragrant exploration. Elsewhere, tour the Dutch colonial buildings, Jewish synagogues and ancient palaces at Kochi; witness a traditional Kerala dance; meet the endangered Nilgiri Tahr of the Eravikuklam National Park; visit the famous Periyar Tiger Reserve; explore the canals of Vembanad Lake; and experience the laidback lifestyle of the relaxed coastal villages. India is often portrayed as a land of bustling, over-crowed super cites. This tour, on the other hand, showcases a very different side of the country. 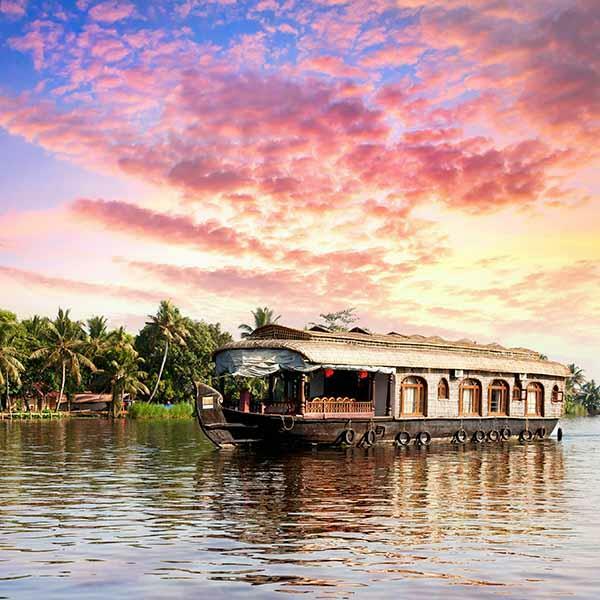 From soaring mountain ranges and lush tea plantations to thriving spice farms and stunning wildlife sanctuaries, you’ll experience all the natural beauty of southern India. And you’ll do so while staying in a luxury collection of distinctive hotels including mountain estates, opulent colonial properties and lagoon getaways.